Neuss, Germany: Toshiba’s 3D capable TV set, the WL768 was awarded the prestigious iF Product Design Award 2011. An international jury of 25 design experts evaluated 2,756 entries in relation to outstanding achievements in design. The premium 3D-TV WL768 with its harmoniously designed looks composed of glass and metal and with eye-catching details such as its ‘floating’ neck design has appealed to the design experts. “The much sought-after iF Design Award is testament to our innovative design concept for TVs that aims to create a stunning design to match the premium technologies packed into the WL768”, said Sascha Lange, Head of Marketing Visual Products Toshiba Europe. The design was developed following a joint cooperation of Toshiba designers with the renowned Danish design studio JACOB JENSEN Design. “Our cooperation with Jacob Jensen Design to develop new approaches to TV design, with the design masterpiece WL768 as a first result, marks the starting point of a new era of Toshiba design,” said Sascha Lange. The designers created a modern, elegant, super-slim (only 2,89cm thick) design with high-quality materials such as glass and metal brought together in a perfect harmony of form and function. An innovative neck design between the pedestal and the body gives an astounding impression, as if the TV is ‘floating’. Furthermore, instead of integrating buttons on the side, the WL768 series models are controlled via a touch panel that is seamlessly integrated into its frameless glass front. 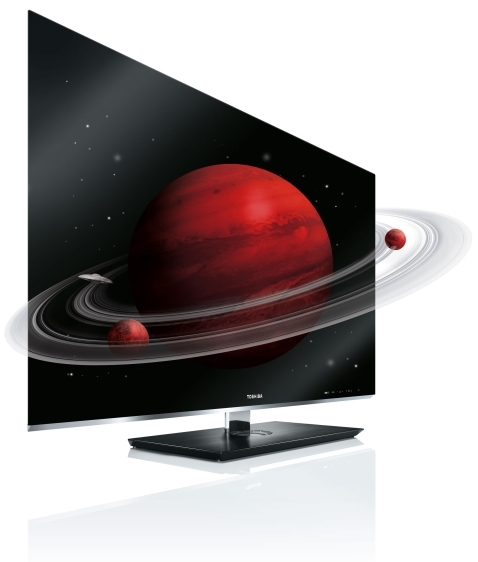 Toshiba’s 3D TVs with screen sizes of 102cm (40''), 117cm (46'') and 139cm (55'') are available throughout Europe.